Countdown to Midnight – Mission Style! Most of us have our own traditions for New Year’s Eve. Whether it be gathering with friends and family to celebrate, quietly spending time at home or even braving the crowds in Time Square, we mark the passing of one year into the next, thanking God for His blessings in the last year and asking for His guidance in the coming one. It is no different in the missions. Over the holidays, I heard from many mission friends wishing me and my family God’s blessings in the New Year. One email in particular stood out. It came from Fr. 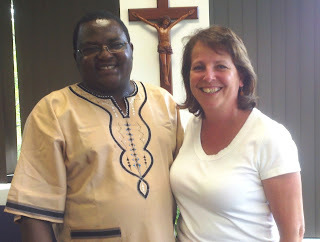 Leo Tinkatumire, PhD, (I tease him – does that make him Father Doctor or Doctor Father? He solemnly assures me he is a priest first!). Father hails from the Archdiocese of Mbarara, Uganda and was home for the New Year’s celebration for the first time in thirteen years. First as a student, then as the Coordinator for his Archdiocesan Mission Co Operative program here in the United States, Fr. Leo had been living in Chicago until last October – a world away in culture and weather from his home in southwestern Uganda. Father wrote of his family’s New Year’s Eve party in Mbarara and sent a message to our whole mission family. May 2013 be a blessing to you, your family and our One Family in Mission. Each day I receive mail from missionaries all over the world. At Christmas, many of them take the time to write personal notes thanking me for the generosity of the people of the Archdiocese of Boston. Recently I received a couple of letters, parts of which I want to share with you. Please accept this letter as my way of reaching out to you and expressing my sincere and heartfelt gratitude for your generous support of our missionary activity in India and East Africa. I am very grateful to you for including us in the Missionary Cooperative plan of your Archdiocese in the past. Thank you so much for this help. Your extraordinary generosity and good will make it possible for us to continue the important work of Jesus. We are always grateful to you for all that you have been to us. As we continue to rely on your prayerful and financial support to sustain our missionary activities, I respectfully request you kindly continue your generous support for our missions in India and Africa. As you know well, mission only happens when those who are sent have the support and encouragement of people like you. Together we carry on the mission that Jesus called all of us to share in order to bring His message of love to all the world. Through the missionary work of the Church, the message of Christ is brought to those who would otherwise never hear it. The preaching of the Gospel makes it possible for Christ to be born, not only on Christmas, but every day throughout the year. In the name of our staff in the Propagation of the Faith office in the Archdiocese of Boston, I want to thank all of you for your support and wish you a happy, healthy, and faith-filled New Year.